Uncle Louie was loved by his nephews and nieces, by his friends, and everybody that knew him. He worked at different jobs at different parts of his life as I was growing up. When I was about seven or eight years old, uncle Louie worked as a milkman deliverer. 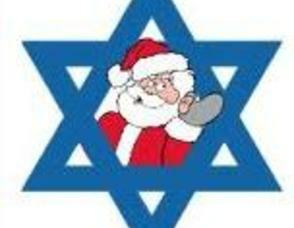 Although my uncle was Jewish, his boss at the dairy asked him if he would play Santa for the children who were those of the other employees of the dairy. Uncle Louie loved his boss and told him he'd do it. Now, Uncle Louie was a tall, thin man; and if anyone didn't fit the part of Santa, it was him. So he padded himself with a large pillow, the traditional costume, a white wig, white beard, the whole nine yards. When the day came for all of those kids to wait in line to see Santa Louie, my cousin Al and I also got in line. When my cousin Al (who was a rascal) saw that it was Uncle Louie, he sat on Santa's lap and then pulled off his beard, and said: "You're not Santa, you're Uncle Louie!" To this Uncle Louie replied, "Oy vey!" A Danish or Ice Cream?